Please welcome Megan Zsaa to the Whole Life Blog today! I’ve never thought of yoga as a “nothing exercise,” but all of you marathon runners and weekend warriors out there should give this article a read. Megan’s right! My yogi friends–what benefits have you seen from your yoga practice? Admit it, you once (or still do!) thought yoga is a bit of a ‘nothing exercise’; a chance for a load of people who have little energy or motivation to do anything else to feel better for heading to the gym. Well – you’ve guessed it – I’m going to tell you that you were wrong to think that! And you only need to get yourself along to a yoga class to fast realize it’s far from ‘wishy washy’, ‘easy’ – or worse still – ‘pretend’ exercise. Yoga is hard, really hard. And there’s a reason the ancient Indian practice has been in existence for centuries – it’s because it works. I really have heard it all when it comes to people’s perceptions of yoga and I felt it was about time to take a stand. Here’s why it’s not quite as pointless an exercise as you might have first thought. Let’s be honest, the word ‘ancient’ is overused. You might joke that your parents/grandparents/[insert other old relative] are ancient, but hey – they don’t come close to the real meaning of the word. The development of yoga can be traced back to over 5,000 years ago. Yep, 5,000 – you read that right. Some researchers believe it could be as old as 10,000 years. So you see, it’s been around a long time – and that alone must mean it offers more than a few benefits. If not, why else would people do it? True, if you get yourself to enough yoga classes you’ll be able to bend and stretch like a pro. Touching your toes? No problem. Splits? In time, maybe. But did you know improved flexibility isn’t the only benefit of yoga?! The hobby can also help you burn calories, too. So if you’re thinking of kick-starting your fitness regime for 2016, you can enjoy all the stress-busting benefits of yoga and a smaller waistline – in time. That said, yoga does burn a relatively small number of calories – but it will help improve everything from muscle tone and strength to balance and posture. Not bad at all, eh? And by happy I’m not just talking about that post-gym feeling of ‘I’ve done a workout so now I have a chocolate bar’. No, yoga actually makes you feel happy in general – it’s been proven! Reducing the stress hormone in your body, it brings about a general feeling of happiness and helps you zone out and relax whilst you’re in the class, too. Result! We bet you don’t need another excuse to sign up for yoga at this point – the fact it burns calories, keeps you fit and reduces stress must be enough, right? Wrong! But there’s another great benefit of yoga – and it’s that it can help prevent illness too. So not only will it ensure you feel good today, it can also stop you getting ill in the future. If you’re someone who’s always got a cold, you’ll definitely want to try this quick move to help prevent you contracting one in the not-to-distant future. Start by sitting sideways next to a wall, or the headboard of your bed. Now, simply lie down on one side, facing away from the wall but with your bottom touching it. Now, using your arms, just lift your legs up the wall as you roll over onto your back. Allow your arms to fall on either side of you, with your palms facing up. Finish by breathing for at least 10 breaths. Go on, give it a go – you know you want to. By now I hope I’ve converted you to the art of the humble – but extremely beneficial – yoga class? And if I haven’t, can I suggest you keep reading up on the hobby; it really will become your new favourite workout if it isn’t already! Megan Zsaa has been a student of yoga for three years and works with Samsara Mind and Body on their health and wellness programs. She lives in London and when she isn’t doing yoga you’ll find her preparing yummy, healthy food or making Kombucha. This entry was posted in Asana, Guest Writers on February 29, 2016 by Tracy Weber. Hi all! Today’s my blogging day at Inkspot, the blog for writers of Midnight Ink, and I’m using it to highlight some of my favorite articles and interviews from the final press push for my third Downward Dog Mystery, Karma’s a Killer. From insider tips on writing and the path to publication, to photographic tours of pivotal settings in the book, to a character interview with Kate, the yoga teacher/sleuth in the series. I’ve had a blast connecting with all of these bloggers and editors! Check them out at http://midnightwriters.blogspot.com/2016/02/wrapping-up-press-push.html and conduct your own interview by asking questions in the comments! I love chatting with readers! This entry was posted in dog books, dogs, Downward Dog Mysteries on February 22, 2016 by Tracy Weber. This past Monday, twenty-two students, five teacher training assistants, and I completed an eleven-month journey together. A journey that saw us through illnesses, addictions, pregnancies, deaths, engagements, divorces, moves, job changes, and more challenges than one could think possible in less than a year. And yet we stuck through it. Together. It was only appropriate that we should celebrate. We began with a ceremony to set intentions and commemorate our time together. We finished in a circle to honor our community. Afterwards we drank wine and ate delicious Greek food. Which is, of course, infinitely more delicious when shared with friends. Before we knew it, it was time to clean up, stack the blankets and head home. But even though the training is over, their work is just beginning. You see, these people are my tracks: the imprint I hope to leave in the world. Taking yoga teacher training is a responsibility. It only starts with the classes, the homework, the missed family events, and the late nights designing seemingly impossible yoga sequences. The real responsibility begins the date you finish. The head of our lineage, Desikachar, says that if you learn the yoga teachings but do not share them, you have stolen them. They are not the property of any individual—they belong out in the world. During our ceremony, we chanted a single mantra: Om Namaha “not mine.” A reminder that what we’ve learned is meant to be shared, whether or not we ever perform another asana. Yoga is the act of living in greater balance, more aligned with our values. Yoga helps us ensure that the tracks we leave behind are positive ones. A personal message to all of these lovely new teachers: You were my thirteenth yoga teacher training, and like each group that preceded you, you were special. I wish I could give you the confidence to know what great teachers you already are, but the best teachers only gain confidence with time and practice. I’d like to say “make me proud,” but you already have. Instead, I’ll just tell you the truth: you’ve each taken a piece of my heart. Namaste, my friends. I am better for knowing you. This entry was posted in Gratitude, Teacher Training, Teaching Yoga, Viniyoga, Yoga Philosophy on February 15, 2016 by Tracy Weber. The study discussed in this article by Yoga Dork has special meaning to me, as I was involved in its design. One of our amazing Whole Life Yoga teachers, Liziah Woodruff, was one of the teachers! The study (which was led by T. Rain Carei, Ph.D. of Seattle Children’s Hospital and published in the Journal of Adolescent Health) included over 50 teens ages 11 – 21, all with diagnosed eating disorders. Half of the teens had been hospitalized due to their eating disorder. Participants were randomized into either a control group that received the “standard care” at Seattle Children’s Hospital or a separate group that received the same standard care plus two hours of Viniyoga a week. More research is needed to see if this work can be replicated in larger groups, but so far Viniyoga seems to be a useful adjunct treatment for individuals with a variety of eating disorders. Go Viniyoga! And I’m so pleased to have been a part of the design of this study protocol. This entry was posted in Asana, Therapeutic Yoga, Yoga Research on February 8, 2016 by Tracy Weber. 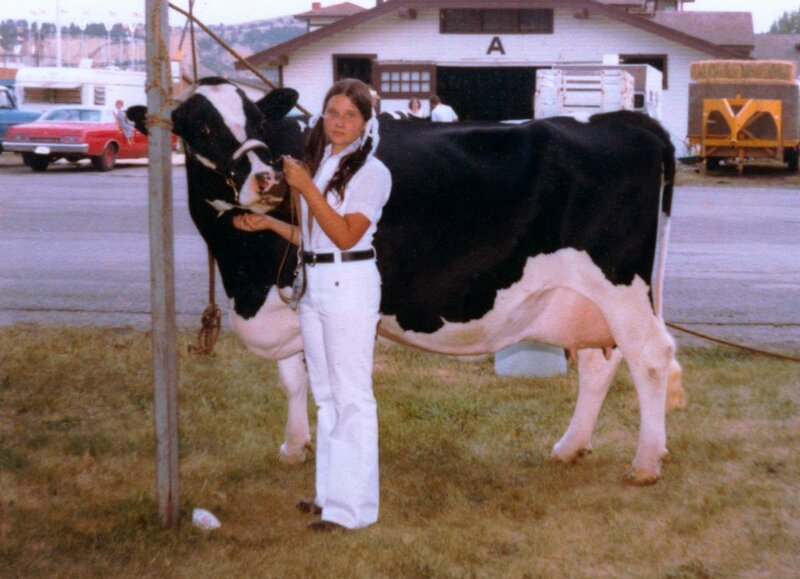 My favorite childhood cow, Beauty. One of the many animals that have had a profound influence on my life. Hey all! This week I’m blogging at Inkspot (the blog for the writers of Midnight Ink) about the many animals in my life and how they’ve informed my mysteries. Check it out and leave a comment about the important animals in your life. Who knows? I might include them in one of my future books! This entry was posted in dogs, Downward Dog Mysteries, Gratitude, writing and tagged inkspot, midnight ink on February 1, 2016 by Tracy Weber.